Designed and developed a food-themed arena survival shooter in a team of four with three GT Computer Science undergrads (Shuyang Cheng, Kyle Florance, Will Wrosser). 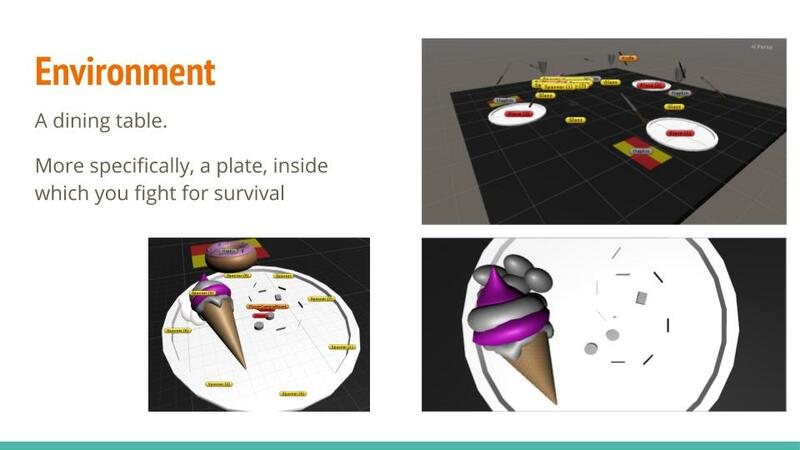 The game was a whimsical take on the survival shooter genre, in which we have the player using food weapons to fight food zombies inside an over-sized dinner plate. The group designed and implemented the arena, four different weapons, and one "food zombie". We used Unity as part of the class requirement. Assets were either handmade or taken websites with free resources such as Mixamo.com. The game reached a playable, early-alpha stage by the end of the semester. My personal contribution revolved around game design, UI design, asset search, and writing user testing procedure. While I was not too adept at coding, I did try my hands on implementing the sound effect system for the game. I participated in the 48-hour MARTA Hackathon, teaming up with three fellow MS-HCI students (Udaya Lakshmi, Jayanth Mohana Krishna, Phillip Roberts) and one MS-CS student (Sonal Jain). My team and I had to conceptualize, design, and prototype an Internet-of-Things solution to one of the subject matters MARTA presented at the hackathon, all within the time limit of 48-hours. My team decided to "hack" together a Bluetooth-based wayfinding system for MARTA train stations, to help MARTA riders navigate their way around the stations. For the hackathon, my team decided to designate a use scenario and develop a Wizard-of-Oz prototype to demonstrate our solutions. Our solution received an honorable mention at the end of the hackathon. The scenario: MARTA riders getting off the train to navigate to the proper station exit, or vice versa. Our solution: Implement a system of Bluetooth beacons (to serve as waypoints) throughout a MARTA station. By utilizing the beacons as waypoints, a smartphone app would guide a MARTA rider out of the station. The smartphone would ask for the rider's destination and find the proper station exit for the rider to continue his/her trek. The app would provide text directions OR a digital compass pointing to the next waypoint, and progressively leads the rider throughout the station. Our prototype & presentation: My team designed an interactive html prototype to demonstrate how the app would guide a rider through a station. We also had artifacts, such as working Bluetooth beacons, prototype compass to utilize the beacons, and a poster explaining our solution. Below are photos of the event, and our poster. The prototype is available here (trying view on mobile). I volunteered to help PhD Student Matthew Guzdial with his project by designing and prototyping an interface for a "Co-Op Level Designer," a program in which computer AI would work with human user to design levels in Super Mario Brothers. An interactive prototype was built in Axure. I chose to base my designs on Google Material Design, modifying colors and fonts where I felt necessary. I also designed the general interaction process, inspired by turn-based strategy games (e.g. Civilization, Fire Emblem series) in which players and computers have discreet opportunities to take action. The resulting prototype was to demonstrate my design for user interactions, and can not handle actual computations. It is shown below. The Sonified Fantasy Football Draft Interface has not been designed by the lab before, with my team beginning the initial designs. I mainly acted as a graphics designer, choosing the color, fonts, layout, and various other visual and audio elements of the interface, in an effort to design a universally accessible draft interface. While the team was not able to ready the interface for user testing and iterating, we were able to create a poster and video demo showcasing the interface in action. 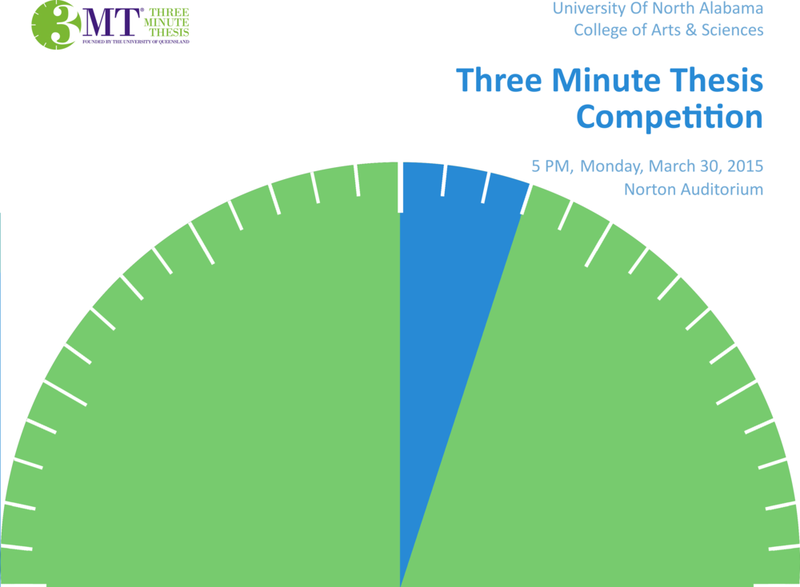 The Three-Minute Thesis (3MT) competition at University of North Alabama, inspired by the 3MT of University of Queensland, provides a venue for students to present their projects and test their presentation skills under pressure. Professor Cynthia Stenger of UNA asked me to design a small program booklet for College of Arts and Science competition. At the day of the competition, the booklet was so well received by the faculty that Dr. Stenger asked to use the same design for the University-level competition. The cover of the booklet is shown. In 2015, the University of North Alabama website was migrated to the new Cascade Platform. I assisted the art department in converting and organizing information on the new platform, as well as creating new content and images, to produce an informative and user-friendly website for the Department of Art. The following screenshots were taken from parts of the new website. 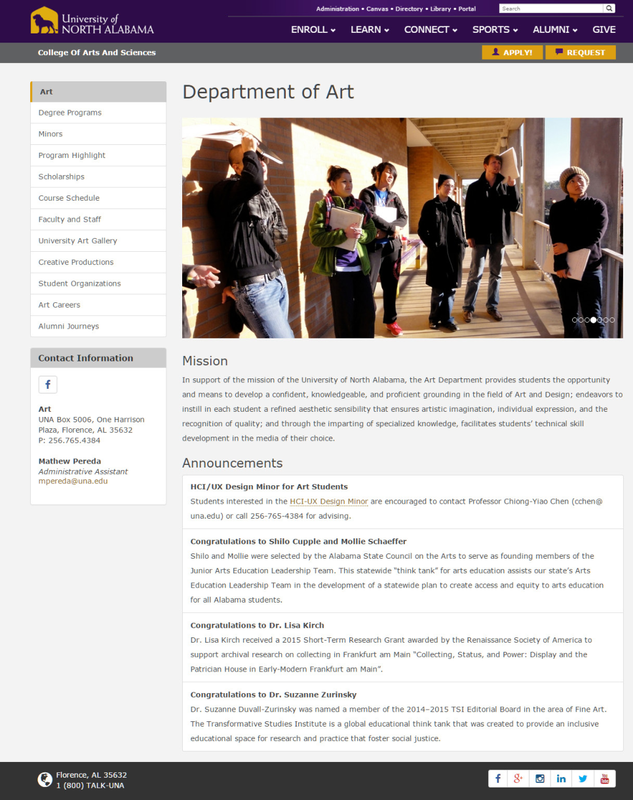 They consist of the Art Home Page and Program Highlight for the new minor in HCI/UX Design. In addition to editing existing information , I also created original content, such as the announcements in the Art Home Page and the entire Program Highlight page. 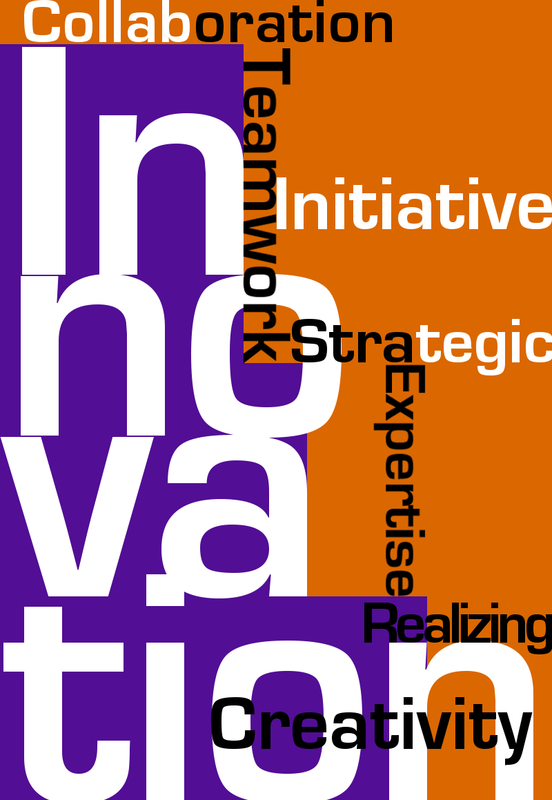 University of North Alabama has begun efforts to create a student innovation incubator to provide resources and expertise to encourage collaborative entrepreneurship in its students. The University tasked the Art Department with designing the collaborative work space, renovated from an old residential house in Florence, AL. I assisted Department of Art by helping to design various graphics and create a 3D model of the work space. The 3D model was made with Sketchup Make, an unfamiliar program that I had to learn quickly. When helping to design graphics for the incubator, I drew on previous graphic design experience from undergraduate courses.